Happy Monday morning! I spent the weekend hanging out with family, watching football and taking a DSLR workshop yesterday morning. Last night I stayed up to watch the Emmy's. Did you watch? I usually love award shows but lately I've found them pretty dull and extremely self-serving (which I know that's the point of them anyway...but it's just sooo obvious), this one included. Modern Family is great...but that was the whole show. I do love watching the fashion though! 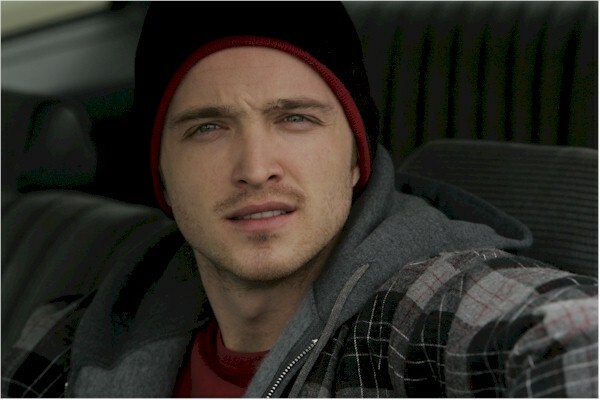 And I smiled like a freak when Jesse from Breaking Bad make a cameo in The Office skit. Love. Since yesterday was football, that meant game day eats! Though the Giants are playing tonight, Shaun and I whipped up a few things to eat throughout the day for the Jets (and the other 10 games he switched between for the rest of the day). I had seen this Greek layer dip in an issue of Food Network Magazine a while back and saved it in my trusty recipe binder, keeping it on file for football season. I'm soooooooo happy that I didn't forget about this one. It's so fresh and so flavorful. No thick, overly creamy cheese that sit like a brick in your stomach here. Shaun and I devoured most of this dip for lunch with some homemade whole wheat pita wedges. The ground turkey gives the dip some meatiness, the hummus, tzatziki, feta and olives give a seriously flavorful bite, and the tomatoes and lettuce bring a bright freshness that makes this dip guilt-free. To make the pita chips, preheat oven to 425 degrees. Layer the pita wedges on a foil-lined baking sheet, or on a wire rack over a foil-lined baking sheet. Spritz with cooking spray and sprinkle with kosher salt. Bake for 7 minutes or until crispy. Brown the ground turkey in a skillet over medium heat. While cooking, season with salt, pepper and oregano. Transfer to a bowl and set aside to cool. Meanwhile, chop up the onion, tomato, olives and lettuce. Serve with pita chips and a big spoon. You're going to need a big spoon for this hearty dip. Shaun took one bite, turned to me with chip still in mouth and said... "This is going in your permanent collection." I'm not arguing with that one! So there you have it. 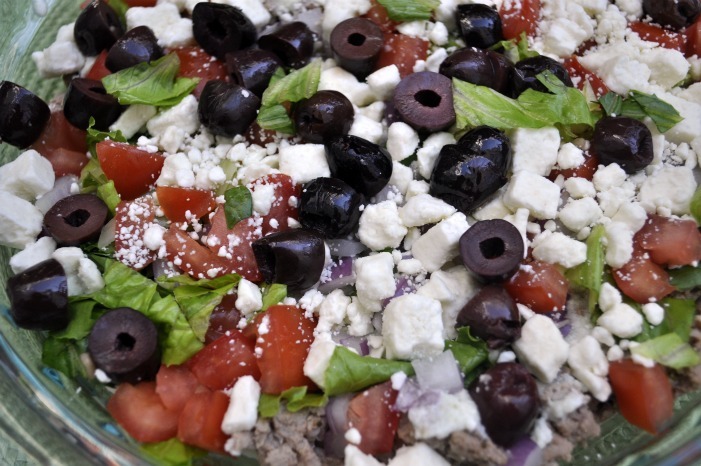 A super easy Greek layer dip that will have you (and your guests) loving every flavor-laden bite! Did you watch the Emmy's? What did you think? Did you eat any new dishes this weekend (that you cooked, someone cooked for you, or at a restaurant)? psst...I'm working on my bedroom makeover and starting with a mood board to kick it all off. Head over to The Peach & The Pit to see my ideas and weigh in!